OBDIIGroup--Best Supplier for Auto Diagnose Tools, Best Price! Best Service! 2016 version Airbag Universal Repair 3.3 Ultimate OBDIIGroup--Best Supplier for Auto Diagnose Tools, Best Price! Best Service! Airbag Universal Repair is the best software for the repair of ECU of aibag, accompanied by a graphical interface very simple and intuitive. 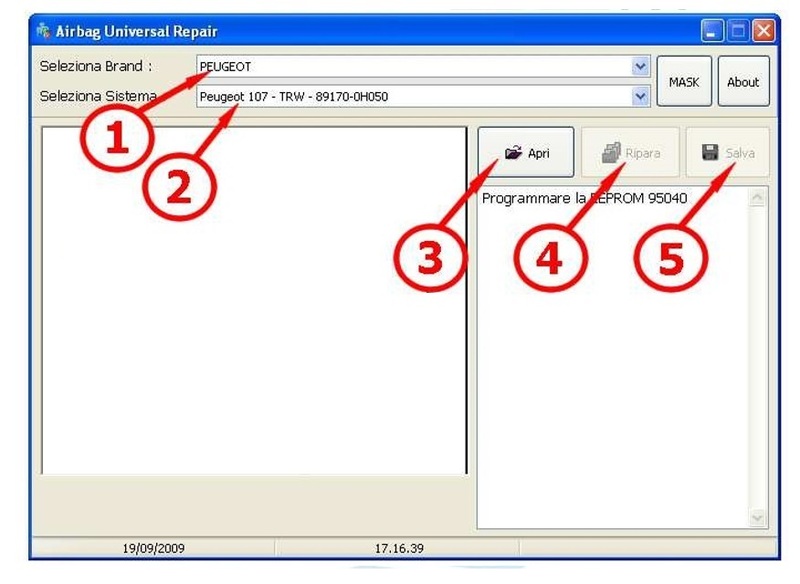 The software Airbag Universal Repair is compatible with read file with programmer such as UPA-USB, Wellon Series VP/GP, Galep and many other (not supplied with the software). Once loaded the read file of the ECU airbag in crash, the software will take care of the repair the file. Following it will be returned one that is worked perfectly, restored the original value of the ECU in crash, once again making it usable. * Airbag Universal Repair has a information box that help the operator to identify the memory to read; also, the button Mask identify a memory catalogued in accordance to standard Bosch and Motorola. At this point reprogramming the ECU airbag with the repair file.